It’s an icon, a symbol of family togetherness, something that nearly all Americans have indulged in, prepared, or cursed at least once in their lives. A family Thanksgiving meal just wouldn’t be the same without it. It’s the Thanksgiving turkey. Whether you have personally prepared this beloved bird or just been on the receiving end of the meal, you know that there are many ways to cook the perfect Thanksgiving turkey. As a kid, my grandma or one of my aunts always volunteered or was designated to prepare the turkey while the rest of the family brought their favorite side dish. Typically, this meant baking the biggest bird they could find in Grandma’s oven for hours. As an adult, family traditions have merged and changed and I have found myself being the chosen one to fix the main dish. I’ve always been one to step outside the box when it comes to cooking, whether it be good or bad, so I thought it was time to do something different for Thanksgiving dinner. That’s where I decided to enlist the help of my husband and his expertise with our backyard smoker. 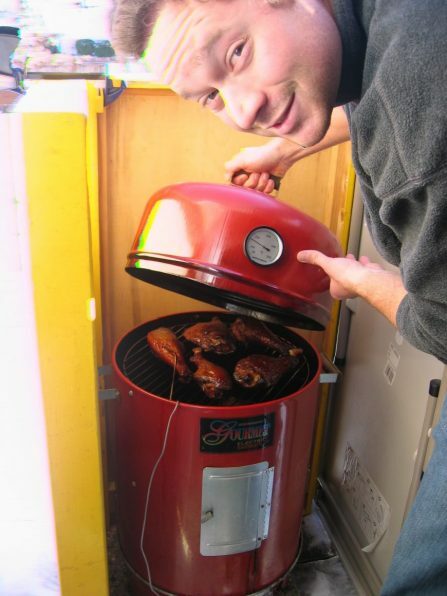 We had several experiences with smoking some delicious meals in our electric smoker that all came out with much success. Everything from pork ribs to turkey legs and even some smoked salmon. But smoking a whole turkey was a whole new experience for us. While it proved to be quite an undertaking it ended with mouth-watering results and a memorable Thanksgiving feast. There are a variety of methods and techniques for preparing a smoked turkey and you’ll probably find yourself experimenting until you find the perfect flavor combinations for your taste. The instructions below are based on our own personal experiences and as long as you follow a few basic instructions you will find that it’s pretty hard to mess up a smoked turkey. Again, keep in mind that the supplies and ingredients you need can change based on your own preferences. They can also change based on the type of smoker you will be using. 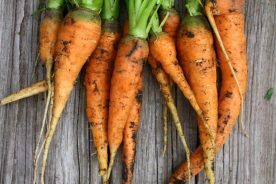 There are lots of recipes out there to follow depending on the aroma and flavor you are trying to achieve. 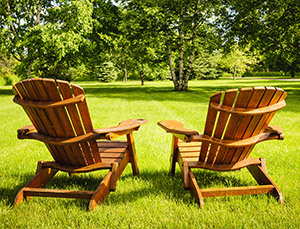 These flavors can come from the herbs and spices you use or just from the fragrance of the wood you are burning. When it came to our meal, we wanted to keep it simple so we used very few ingredients on the turkey and let the smoke itself infuse the meat with flavor. 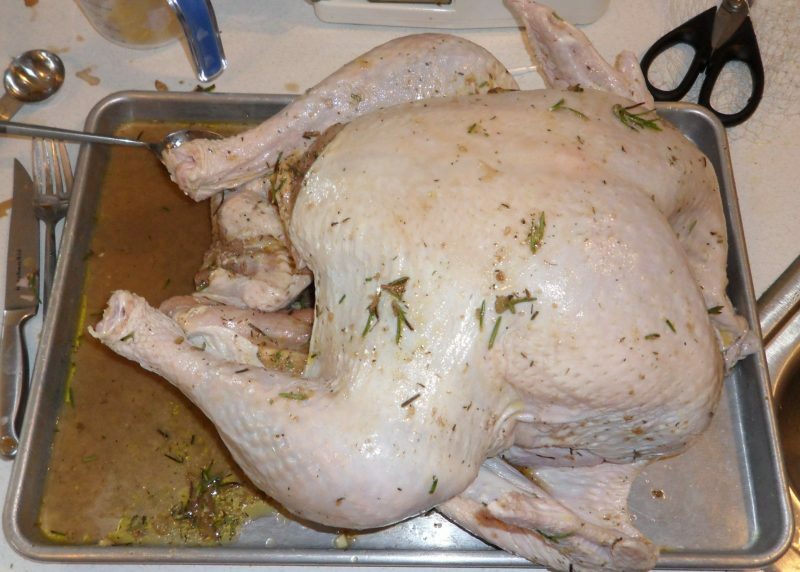 Before doing anything with your turkey you will want to make sure it fully thawed. You can then remove the neck and giblets as well as the pop-up timer if it came with one. It is recommended that you remove any excess fat around and under the skin while being careful not to remove much skin or tear it if possible. The skin works to retain moisture while smoking and also hold in the flavor. Next you’ll want to rinse the bird with cold water and pat it dry. We started our turkey by soaking it in brine for 24 hours. While this step is not a necessity it does give the meat a more tender texture and more flavor. 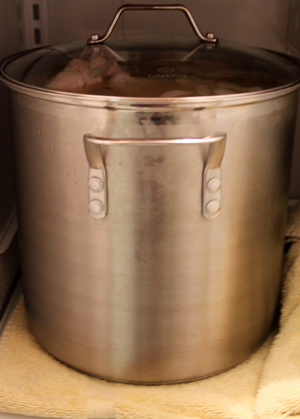 You will definitely need to plan ahead if you are going to brine the bird as it typically needs to soak for 24-48 hours. All you need for this is a large stock pot filled with water and salt. Place the bird, neck side down in the water and cover it with a lid to keep it from floating up out of the water. Place it in the refrigerator. The next step is where all of the variations in flavor are involved. We started by finely chopping some garlic, onions, and rosemary. We melted about 1 ½ cups of butter and mixed the onions and herbs into the butter along with some salt and pepper. After removing the turkey from the brine we patted everything dry so the butter rub would stick more readily. We then rubbed the butter mixture all over the turkey, getting under the skin as much as possible as well as working it into the spaces between the legs and wings as well as pouring some into the cavity of the bird. Some people like to inject the meat with a marinade made from a combination of butter and various spices. We did this with some turkey legs we smoked and it turned out extremely moist and flavorful. It is probably something we will do with our next Thanksgiving turkey. If you aren’t comfortable concocting your own rubs or marinades, there are numerous recipes available online. The method for the preparing your smoker is relatively simple. 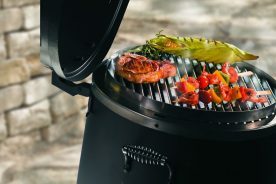 No matter which type of smoker you have, the basic steps are the same but can vary slightly whether you have an electric smoker, a gas smoker, or a charcoal smoker. Our electric smoker simply needs to be plugged in and the heating element begins heating up the lava rocks at the bottom. It only takes a few minutes to heat the inside to the desired temperature. 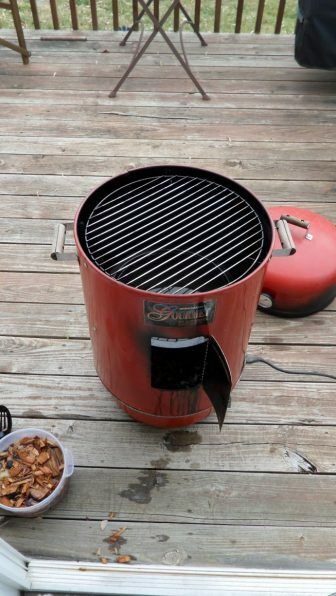 With a charcoal smoker you will want to allow enough time to light the coals and let them burn until they are white. 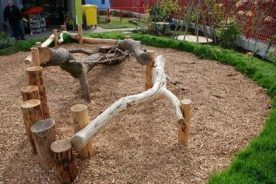 Once the rocks or coals are heated you can place the wood chips or chunks on top of them. We like to soak our wood chunks in water so they do not burn as quickly and we typically use something with a fragrance like Applewood or hickory. A lot of the best smokers come equipped with a pan for water that sits above the coals and wood but below the rack where the turkey will sit. Fill this pan with water to keep moisture inside the smoker while the turkey is cooking. We chose not to, but you can add ingredients to the water such as apple cider, lemon or white wine that will mix with the smoke and infuse your turkey with a whole new flavor. After your smoker has reached the desired temperature of around 230-240 degrees Fahrenheit, it is time to add the turkey. You want to place the turkey breast side down on the cooking rack as this is the portion that will take longest to cook. It is a good idea to spray the cooking rack with oil to prevent the skin from sticking. Our bird proved to be quite large and tried to stick its legs and wings out, so we held them together with wooden skewers. 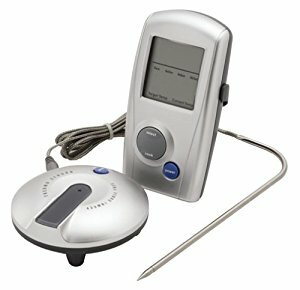 When smoking any meat, we use a wireless, digital thermometer to keep tabs on the internal temperature of the meat. The thermometer is placed into the thigh or other thick, meaty portion of the turkey. It then has a wire that leads to a transmitter that can sit right outside the smoker. The transmitter sends a message to a digital display in the house where we can watch the temperature rise. Our thermometer also allows us to set a desired, final temp and will then beep when that temperature is reached. Finally, close the lid and let the smoker do the work! Do I need to do anything to the smoker while it is cooking? You shouldn’t need to do a lot while the turkey is smoking. In fact, it’s better if you can leave the turkey alone as much as possible as lifting the lid or opening the smoker door can let out a lot of the necessary heat. Watching the temperature of the smoker (most of them are equipped with an outer thermometer) is the most important task. Your smoker’s inside temperature should be kept at about 230 degrees Fahrenheit. 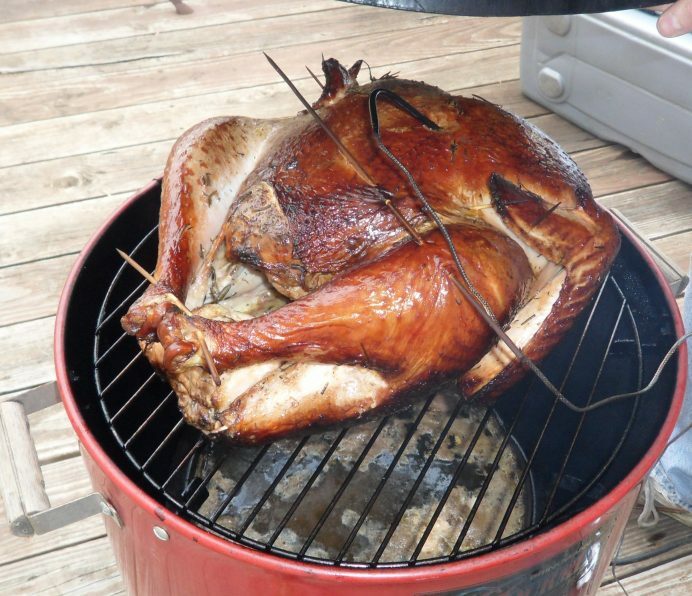 Unless your smoker is having a difficult time retaining heat you should check on the turkey every 1 ½ – 2 hours. At this time you can open the lid to baste the turkey using either any butter and herb mixture you have left over from the turkey prep or the aromatic water from the pan underneath. This is also a good time to add water if the pan is nearly empty or add more wood if the chunks are burning up. 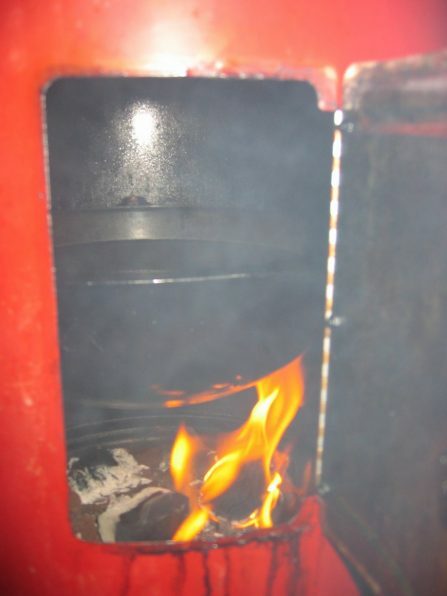 If you are located in a cold climate like we are you will find that you’ll need to add wood more often as the smoker has to work harder to keep the heat inside. We have actually gone as far as building a small wind block out of wood panels to keep the wind from affecting our smoker’s temps. 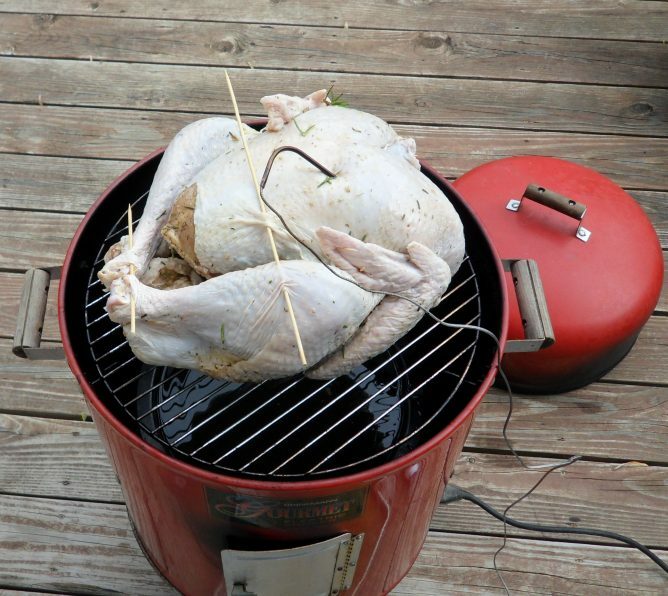 The time it takes to thoroughly smoke your turkey depends on two things. First, the size of the bird and secondly, the type of smoker you are using. As mentioned before the outside temperature can also affect cook time if it causes the smoker’s internal temps to fluctuate frequently. A good rule of thumb is that the turkey should reach an internal temperature of 165-175 degrees. This usually takes about 25-40 minutes per pound. So if you’re smoking a fairly large turkey to feed your entire family you will want to leave yourself plenty of time. We smoked a 12-pound turkey that took approximately 5 hours. Another thing to keep in mind is that a smoked turkey will look very different when it is done compared to a baked turkey. The outside skin tends to turn very dark, almost black. Don’t be alarmed if this happens, you have NOT burned it. You will also notice that the inside is a pinkish color. 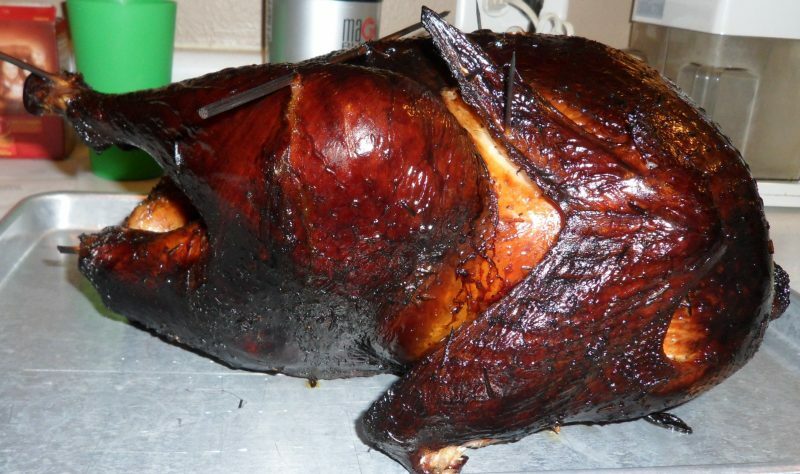 While pink poultry is usually not a good thing a smoked turkey has this color due to the smoke infusing the meat. As long as your meat thermometer is showing a good internal temperature the color should not be an indicator of done-ness. One last step in a quality smoked turkey is the final step of letting it rest. Most other cooking methods do not require this step, but by doing this the turkey will finish its cooking and meld the flavors even more and let the moisture absorb back into the meat. After removing the turkey from the smoker let it sit on a platter or pan and fashion a tent over it using aluminum foil. It is recommended that you let the turkey rest for about 25 minutes before carving it up and serving the family. You should have all the basic knowledge you need to smoke a delicious Thanksgiving turkey using your own backyard smoker. The only thing you need to do from here is figure out how you’d prefer to season the turkey. There are lots of recipes available or you can keep it simple and just use some basic spices like salt, pepper, or garlic. Make your Thanksgiving meal complete by adding all of your favorite side dishes and desserts to serve with the meal. Our family meal traditions include mashed potatoes, stuffing, sweet potatoes, rolls, and green bean casserole. 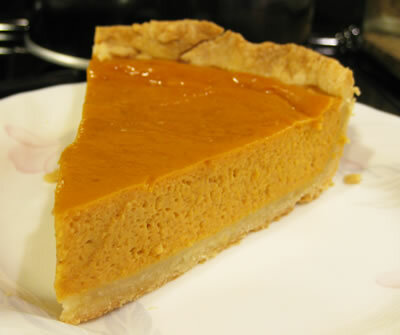 And as if we weren’t full enough after all of that you definitely need to end dinner with a slice of Grandma’s pumpkin pie.